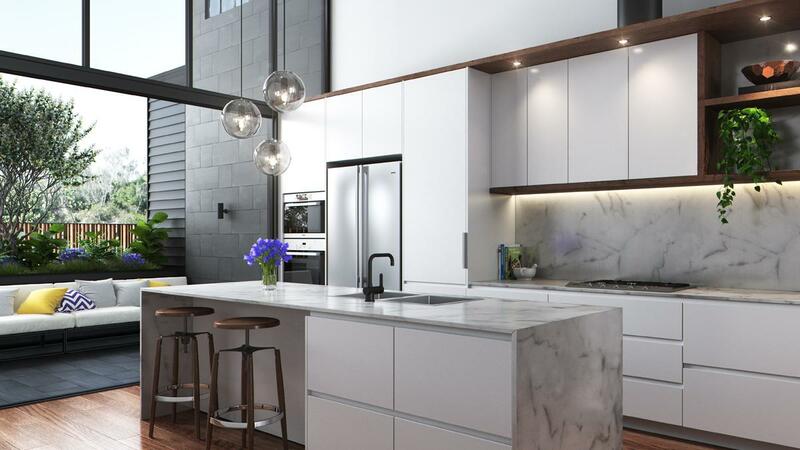 Brand new luxury designer townhouses located in one of Brisbane’s exclusive locales. Meticulously crafted with an unmatched quality of fixtures, fittings and finishes, these townhouses provide new heights in luxury living and understated elegance. Each townhouse has been designed with a thoughtful focus on modern day living, functionality and style. Designed for the discerning buyer, it offers large fully ducted living spaces with rich timber floors, lush carpets, stone surfaces and bespoke joinery, providing comfort, space and style in the heart of one of Brisbane’s exclusive leafy suburbs. The high ceilings, expansive windows, glass bi-fold doors and open plan living exude a feeling of luxury to create a heightened sense of light and space. The upstairs open plan living and the open plan multi purpose area downstairs offer chic private areas and plenty of room for the whole family to live, entertain, unwind and relax. Canopy Taringa is located only 5.5kms away from Brisbane’s CBD. Positioned between two shopping centres – Indooroopilly and Toowong, this enviable address, in a neighbourhood where everything is within easy reach, offers all of today’s modern conveniences – schools, universities, hospitals, cafes, restaurants, cinemas, shops, transport and parks.